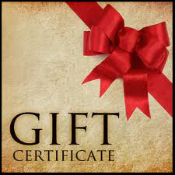 Gift Certificates are availble from $10 to $200. Within 24 hours you will receive a coupon gift code that can be used immediately and will also receive a paper certificate in the mail to give. If you do not wish to receive your gift code by email please call us after placing your order.